So, it felt like this took a looooong time to produce, from inception to publication, but the Technology Special Edition of InfoLink (PDF) is out! My hands are all over this. 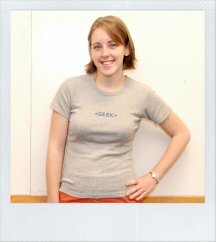 I wrote the lead article and did the interview, came up with the idea for the geeky shirt photos and recruited geeks, and even edited the announcements in the back. Overall, I’m happy with how it came out, but I would have used the geeky shirt photos differently if I were the designer. The photographer (hi Olivia!) put these cute polariod frames around them, and I pictured them scattered throughout the issue at weird angles, with the text wrapping around appropriately. Oh well. Our designer isn’t trained as a designer, and does this as one small part of her job function (and it is completely unrelated to everything else she does and was hired to do, I think). Can’t say I blame her for just wanting to get it done! Photo by Olivia Gatti. I’m wearing this shirt.